Unfortunately, the clocks will soon be moving back an hour as the autumn and winter months draw in. Bi-folds are a popular and beautiful addition to any home, but they’re often marketed as a great asset to have during the summer months. You can open the doors and incorporate your garden into your living space with ease. However, in the autumn months, you may find that you’re opening your bi-folds less and less, and as the depths of winter approach, it’s unlikely that you’ll want to open them up at all. So what benefit do bi-folds have when it’s too cold to use them as they were intended? Insulated Warmth – Through either double or triple glazed glass, bi-folding doors are extremely thermally efficient. New technologies and cutting-edge techniques ensure that the frames are attached to the glass in a draught-proof way. The frames are also great for thermal efficiency, with aluminium and UPVC both providing insulation and protection against elements. Retain Connection with the Outdoors – Having bi-fold doors means that you get to enjoy the outside world without having to be part of it, and of course this is very helpful during winter months. You can stay inside wrapped up warm, enjoying the views to their fullest potential. You will essentially have an entire wall made of glass, so make the most of observing the winter scenery in the comfort of your home. Enjoy the perks of Winter – Having an abundance of glazing can open up your world in the winter months without subjecting you to the harsh temperatures of autumn and winter. Whether your home is situated in the city or the countryside, you can enjoy he perks of winter through your bi-folds. Imagine fireworks, snowing and bonfire night – all of which can be enjoyed from your armchair, as you have a front-row seat with your bi-folding doors. Increased Light - As we’re all painfully aware, it’s that time of year to wrap up as much as possible. You leave for work in the dark and end up getting home in the dark, so one of the best ways to help beat the winter blues is to ensure you’re getting enough natural light when you’re able too. 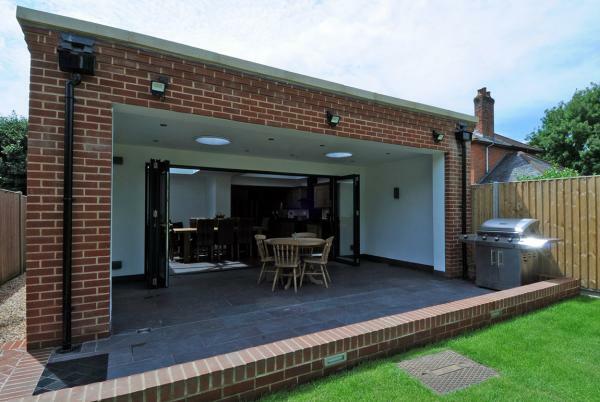 Bi-folds are one of the best solutions for your home in this respect, as they include large floor to ceiling areas of glazing with minimum frame thickness, giving you optimum levels of light whenever it’s available.